Gah! It feels like way too long since I’ve been here! Can you believe we’re zeroing in on mid-October already?! I started a new job in early September (look at the view!) and though it already feels like a lifetime ago, I am sosososo thankful to kiss my last job good-bye. Ever work in a toxic environment? One that you, with every fiber of your body, dread getting up to in the mornings to go to? One where you’ve dealt with unstable coworkers and less than supportive bosses? One that actually makes your stress manifest physically? One where you feel like you are adding nothing to the universe? Hi. That was my last job. It was baaaad. Since starting my new position (same workplace; different department, projects, coworkers, boss, etc.) I feel like a new person. I’m back in the kitchen rather than moping around the house at night. And with this new position, comes some really great nights of sleep. I know, it sounds weird, right? But I’m so busy and stimulated during the day that after a workout and dinner, I’m zonked and in bed by like 8 or 9, virtually stress free. This, however, also cuts into my evening blogging time. Which is not to say that I haven’t been thinking about things to make and share with you, but it’s the execution that’s been a little poor. That is with the exception of this past weekend, I suppose. See, we’re in Maine this week (!!!) on vacation (!!!) and I whipped up a couple snacks to bring with us, as per my usual road trip prep plans. 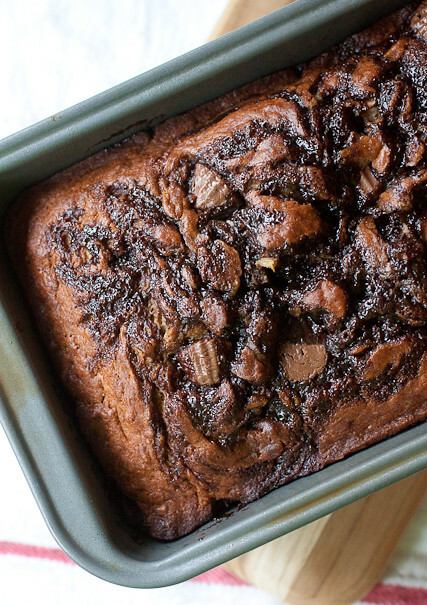 This peanut butter cup hot fudge banana bread is something I’ve been considering for quite a while. With mini peanut butter cups making baking so easy (no unwrapping God-awful amounts of peanut butter cups), I threw a bunch into my banana bread batter and swirled in some hot fudge I had hanging around the fridge. And yeah, it’s just as amazing as it sounds like it would be. There’s nothing ordinary about this banana bread with its chunks of peanut butter cups and layers of hot fudge. It only further reinforces my need for those afternoon workouts. After, of course, I’m finished gorging on lobster this week and I’m back and my heaven-sent new job next week. But for now, just hand me a fork. I opted to cut the all-purpose flour down in this recipe to 1 cup and substitute 1 cup of white whole wheat flour in for the extra cup of all-purpose the original recipe called for. You seriously would never know the difference by looking at or tasting this banana break that it's made with half whole wheat flour! Preheat the oven to 350° F. Butter and flour a 9x5-inch loaf pan. In a large bowl, whisk together the flours, sugar, baking soda, and salt; set aside. In a medium bowl, stir the mashed bananas, yogurt, eggs, butter, and vanilla together with a wooden spoon until combined. Add the peanut butter cups to a separate medium bowl and scoop 2 teaspoons of the flour mixture into the bowl. Toss the candy with the flour until it is well-coated. Fold the banana mixture into the dry ingredients (not the candy) until they are just barely combined. Pour the peanut butter cups and remaining flour from the bowl into the batter and gently stir the candy and flour in until the candy is well-distributed and no streaks of flour remain. Transfer half of the batter to the loaf pan, smoothing it into the corners of the pan. Drizzle half of the hot fudge sauce over the batter and swirl it into the batter with a knife. Dollop the remaining batter gently over the hot fudge layer and smooth it out with a knife or off-set spatula. Drizzle the remaining hot fudge sauce over the top and swirl it around again with the knife. Bake for 55 minutes or until a sharp knife or long toothpick inserted into the center comes out clean of batter. (This may be hard to recognize because the fudge and peanut butter will likely stick to the knife but trust me - 55 minutes will be enough time, especially if you use a darker pan. As long as what is on the knife doesn't taste like banana bread batter, you're good to go.) Cool the bread in the pan for 5 minutes on a wire rack then remove the bread from the pan and let it cool completely on the rack before slicing with a serrated knife. It gets better after a couple of days so wrap the leftover loaf tightly with plastic wrap and keep it at room temperature. Preheat the oven to 350° F. Butter and flour a 9×5-inch loaf pan. Bake for 55 minutes or until a sharp knife or long toothpick inserted into the center comes out clean of batter. (This may be hard to recognize because the fudge and peanut butter will likely stick to the knife but trust me – 55 minutes will be enough time, especially if you use a darker pan. As long as what is on the knife doesn’t taste like banana bread batter, you’re good to go.) Cool the bread in the pan for 5 minutes on a wire rack then remove the bread from the pan and let it cool completely on the rack before slicing with a serrated knife. It gets better after a couple of days so wrap the leftover loaf tightly with plastic wrap and keep it at room temperature. Wow, nothing ordinary indeed! The peanut butter chocolate banan combination is perfect. 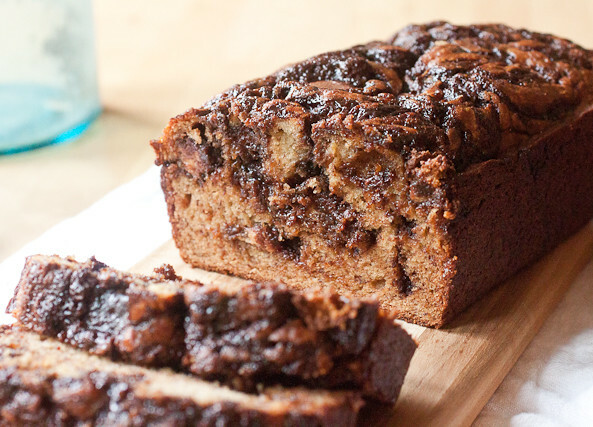 Love that you stuffed banana bread with hot fudge and peanut butter cups! This bread is seriously a dream! Hot fudge? Sign me up!! Well, that looks completely fabulous! Hope you guys have a fab vacation! 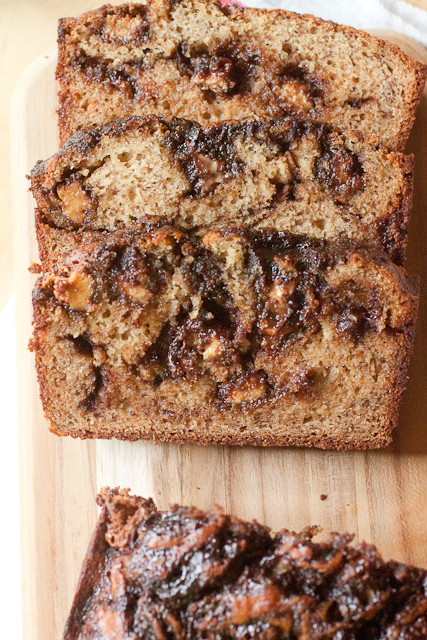 Oh my, that’s one delicious banana bread. Glad to hear about your job, it’s horrible to hate your job. Saved and pinning, I need to make this. Best banana bread ever!! Congrats on the new job, and enjoy your trip! Congratulations on your new job! This bread looks incredible! Love the pb cup addition! YUM. This looks SO GOOD! Congrats on the job! yay for new job and yay for vacation! Celebrating Homemade English Muffins with Smells Like Home’s 1st Giveaway!